Such unprecedented access to the normally inaccessible seafloor is allowing scientists to address a diverse range of scientific questions relating to the formation, hydrothermal alteration, and biotic and abiotic weathering of oceanic lithosphere, and the role of oceanic crust in global geochemical cycles, including the carbon cycle. The project focuses on both weathering in the mantle peridotite and the resident subsurface biosphere. These studies will contribute to our understanding of microbial ecosystems in extreme environments and the origins of life. The Deep Carbon Observatory was an early champion of the Oman Drilling Project, supporting an initial planning workshop in conjunction with the International Continental Scientific Drilling Program. Nine other funders have since joined DCO in support of the drilling project, and 31 research institutions from around the globe have joined as partners in the scientific investigation. Reservoirs and Fluxes member Peter Kelemen (Columbia University, USA) serves as chief scientist for the project. Numerous other DCO scientists have participated in the project, both in the field and in the lab. 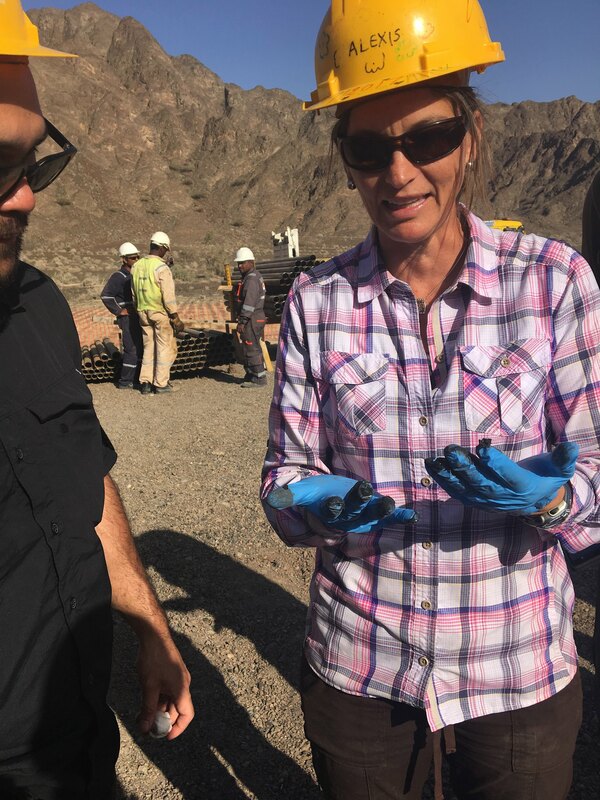 To date, almost 200 scientists from a broad spectrum of disciplines and more than 20 nations are using new datasets resulting from the Oman Drilling Project, and more than 100 investigators have worked onsite in Oman. The team has completed two phases of drilling; the first ran through December 2016-March 2017 and the second from November 2017-February 2018. Over the course of six months in the field over two years of seasonal drilling, the scientific research team recovered a total of 3200 meters of core. Logging and analysis of the phase one samples took place on board the Research Vessel Chikyu while the ship was docked in Shimizu, Japan. The shipboard science party of 67, including six Omani trainees, logged 1500 m of core while onboard from July-September 2017. This was the first time that hard rock cores were analyzed using the Chikyu labs. Phase two core logging will take place from 5 July-5 September 2018 with a science party of 87, including seven Omani trainees, again using D/V Chikyu’s sophisticated onboard lab. How is oceanic crust created and modified? The overarching goal of scientific drilling in the Samail ophiolite is to understand the full spectrum of processes that create and modify oceanic crust and shallow mantle, involving mass and energy transfer between the mantle, the crust, the hydrosphere, the atmosphere and the biosphere over a range of temperatures from ~ 1350 to 20°C, depths from the surface to 10 or 20 km below the paleo-seafloor, and tectonic settings from spreading ridges to the deep ocean to surficial weathering to subduction zones. How is the seafloor altered? How is carbon recycled deep within Earth? The project is addressing long-standing unresolved questions regarding formation of oceanic lithosphere at mid-ocean ridges, hydrothermal alteration of the sea floor and subsequent mass transfer between the crust and the oceans and recycling of volatile elements in subduction zones. The science team also will undertake frontier exploration of subsurface weathering processes that lead to natural uptake of CO2 from surface waters and the atmosphere, and the nature of the subsurface biosphere in areas where these processes are occurring. What is the nature of the microbial ecosystem living in the Samail Ophiolite? How do these microbes harvest the energy of water-rock reactions? The Oman Drilling Project Phase 1 Science Party consisted of 77 scientists, 30 of whom participated in the field, and 67 aboard the D/V Chikyu. The Phase 2 Science Party consists of 115 scientists, 65 of whom participated in the field and 87 of whom will participate aboard the D/V Chikyu. Phase two of the Oman Drilling Project began in November 2017, and the team is currently hard at work collecting cores and cuttings. Operations will continue until March 2018, completing the rock sampling part of the project. During phase two, the team are focusing on sites CM1 and CM2 (crust-mantle transition) and BA1, BA3, and BA4 (active serpentinization), collecting samples for geological, hydrological, and biological analyses. On 15 September 2017, scientific Drilling Vessel Chikyu arrived at Hachinohe Port, Japan and members of the Oman Drilling Project(OmanDP) core logging team disembarked with cases of precious samples. The shipboard Science Party of 67, including six Omani trainees, logged 1500 m of core while onboard over the last two months. This was the first time that hard rock cores were analyzed using the Chikyu labs. Most of the core logging took place while Chikyu was in port in Shimizu, near Tokyo, however the team ended their time onboard with a two-week transit to Hachinohe, in northern Honshu. Phase one of the Oman Drilling Project has moved to Japan, to the drilling vessel Chikyu, where detailed analysis of cores is underway. The shipboard Science Party of 67, including six Omani trainees, is performing detailed, IODP-standard logging of 1500m of core. The core logging, which began earlier this month, will continue through 15 September 2017. This is the first time D/V Chikyu core logging facilities have been used to process hardrock drilling samples.Read more here. The Oman Drilling Project, co-sponsored by the Deep Carbon Observatory, began operations on 18 December 2016. The core logging will continue through 15 September 2017. This is the first time D/V Chikyu core logging facilities have been used to process hardrock drilling samples.